Early in the history of our species, predicting the motions of objects in the sky was a matter of survival. Celestial cycles were related to seasons, tides, and the migration and growth of what we ate. 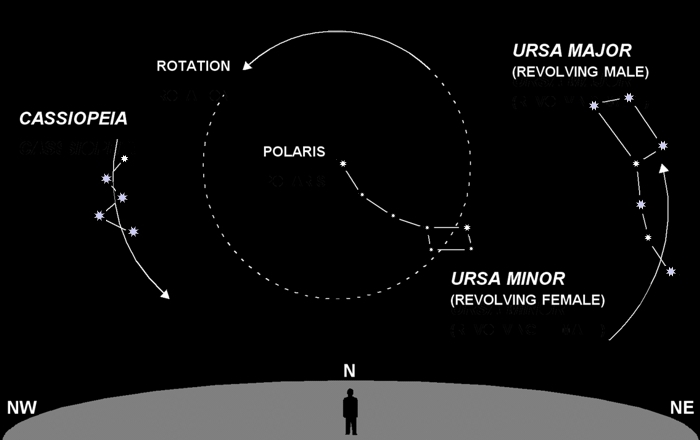 Revolving Male [Ursa Major] and Revolving Female [Ursa Minor], run in endless circles around North Fire [Polaris] with the woman in pursuit. Black God was assisted by First Man and First Woman in his task of building the sky. He rewarded them by giving them permanent places in the heavens. By the way, “North Fire” in that legend means “star that never moves.” It was a special crystal put there by Black God to aid travelers at night. And indeed, it still aids travelers who use the sky to navigate. It tells them which direction is north, and its elevation tells them their latitude. Fast forwarding to modern astronomy, we now know it’s Earth’s rotation that causes this apparent stellar motion. The stars don’t really move. Well … actually they do, but so slowly you’d need a powerful telescope, and lots of time, to detect it. In these modern times, Black God is resting. The two most prominent circumpolar constellations are Cassiopeia (aka the “W”) and Ursa Major (aka the “Big Dipper”). They’re called circumpolar because they circle Polaris, and from latitudes >40° are always visible. From Arizona’s latitude of 35°, the Big Dipper dips about halfway below the horizon, and the W just skims it. This time of year, both are visible and at about the same elevation. These two constellations are always opposite each other as they revolve around Polaris. So you can always see at least one of them unless you’re deep in the southern hemisphere. To find Polaris, just draw a mental line that splits the W, or a line that extends from the front of the Dippers bowl. Those lines will point to Polaris. Once you find Polaris, you might be surprised to see that it’s not really that bright. Somehow, the idea that Polaris is the brightest star in the sky continues to circulate. It is the brightest star in that general location, but the distinction of brightest star goes to Sirius (on the opposite side of the sky). I’m not sure why Cassiopeia is known as the W since, as it rotates around Polaris, it sometimes looks like an “M” or “E” or “3,” depending on its orientation. The Dipper is far less ambiguous.